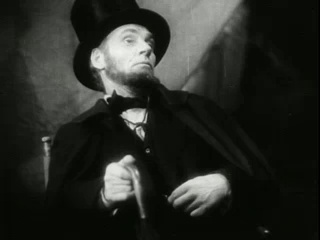 Abraham Lincoln, also released under the title D. W. Griffith’s “Abraham Lincoln”, is a 1930 Pre-Code biographical film about American president Abraham Lincoln directed by D. W. Griffith. It stars Walter Huston as Lincoln and Una Merkel, in her second speaking role, as Ann Rutledge. Her first speaking role was in a short film, Love’s Old Sweet Song (1923) filmed in the Phonofilm sound-on-film process. The script was co-written by Stephen Vincent Benét and Gerrit Lloyd, author of the Civil War prose poem John Brown’s Body. This was the first of only two sound films made by Griffith. The film entered the public domain in 1958 due to the rights holders failure to renew the copyright after 28 years.